You probably read my previous story about my One Week on Instagram. Instagram which was recently acquired by Facebook uses Ubuntu Server 11.04 to power their cloud. 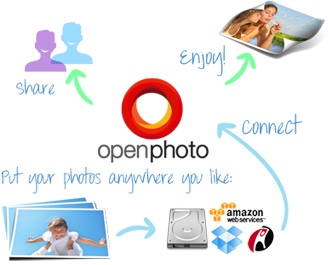 OpenPhoto which was a Kickstarter project and is becoming very popular in the wake of the Instagram acquisition is also powered by Ubuntu Server 11.04 but offers users the ability to take total ownership of their photos and rapidly deploy a crisp new way to manage photos. What is the story behind OpenPhoto ? The inception of OpenPhoto was a desire to liberate our photos and take back control. Like you, our photos are the most valuable digital files we have. Also like you, we've used Flickr, Picasa and Smugmug and wound up with our photos scattered across numerous sites on the web. We knew there had to be a better way to take, share and archive photos while retaining ownership. It didn't seem like anyone else was going to build it so we took it upon ourselves to solve this problem for everyone. Is the project open source ? Can I fork your project ? The project has been open source on Github since the first line of code was written because like your photos, OpenPhoto doesn't belong to us. Even if you're not an open source junkie it's important to understand why being free and open source is so important. It means anyone can use the software any way they like. Much of the greatest software available today is open source or based off open source software. Open sourcing OpenPhoto means that the community is in control of their own destination. Sub communities can even embark on a new path to a different destination. Imagine a professional photographer taking OpenPhoto and catering it to the needs of their colleague. Or a group of mothers using OpenPhoto to tell the stories of their children as they grow up. Where do you see OpenPhoto is heading ? We don't know where OpenPhoto will head but we're excited that you'll be making the calls.